Carlos Perez, who has worked in the medical field for more than twenty-five years, is the Founder and owner of Affordable & Quality Home Care Services. Carlos believes it is important for caregivers to truly understand their clients’ personalities and lifestyles in order to cater their care to fit the client’s needs. He takes a look at each client’s personality and specific needs and then finds a caregiver whose personality and expertise will fit best for the client. We understand how difficult the search for a caregiver can be, especially when it is for a beloved family member. We strive to ensure that only the best service and care will be given to all clients. We continually work alongside other local and out-of-town healthcare agencies and doctors to ensure premium care for our clients. We believe that the only way for our services to be successfully received, we must expand our work scope and be willing to function shoulder to shoulder with other professionals. After all, health situations can sometimes be unpredictable and we need all the help we can get. Most importantly, we consider the role of the clients in their recovery and health management. We keep them well-informed of their health situation, what choices there are for care delivery, and how we can work cohesively to achieve the best results. 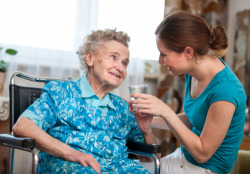 Affordable & Quality Home Care Services is a trustworthy home care company. Our exemplary services are designed to achieve the optimum health of our client and all the comforts that their own homes offer. Please call us at 760-468-3075 for your inquiries or concerns.